Everyone always asks Connecticut about his unusual name. He doesn't like being asked, but he explains that his mother was the Governor of Connecticut at the time of his birth seventeen years earlier. Shortly after he was born, his parents were killed and Connecticut was raised by his grandmother. Connecticut's grandmother became too elderly and sick to care for him and that's when Connecticut was adopted by the Reese family who secretly live in a very special place -- Grand Central Station in New York City. 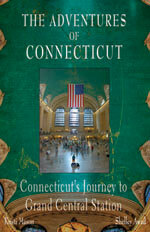 Once Connecticut arrives at Grand Central Station, he meets his twin brothers, Jordan and Christopher, and the adventures begin! Co-Authored by 17-year-old Kristi Mason, who is an exceptional student with learning disabilities, this adventure will appeal to children aged 9 to 12, or to special education students of any age!